Q: What is your history ? 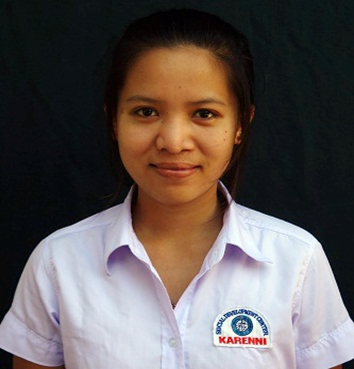 A: I am a Kayah woman, born in Saw Uyoe Lay on the Thai-Burma border. My parents are from Shadaw, Karenni State. I’ve never been to Karenni State and grew up in the camps. First, I lived in Karenni Refugee Camp 3 but later we were all moved to Karenni Refugee Camp 1.I studied from nursery school to grade 10 in the camps. After that I completed the SDC basic course 2012-2013 & 4th ACMTC . Q: Why did you apply to SDC? A: After grade 10, I was interested in the environment, human rights and the rule of law so I applied to SDC. Most of our community doesn’t understand human rights, the environment or rule of law. These issues are very important for our people. So for me, I knew if I could learn about these subjects, one day I could share this knowledge with other people. Q: What effect did SDC have on your life? A: Honestly, before attending this course I did not know anything about human rights. After attending this course I have learnt a lot about this subject. In particular, the inherent value of human rights and I can explain about how human rights are concerned with everyone and how myself and other people must protect their rights. Before this course I did not know this. With regards to environmental issues, I didn’t treat these issues as important prior to this course. Now, I am aware of these issues and recognize the importance of environmental protection especially, plastic and deforestation. I, now, understand this is our responsibility and I remind people not to damage their environment. Before attending this course, I didn’t know about law in detail. I didn’t know anything about articles and procedures. During this course I learnt about procedures and how to address the prosecution and accused equally. If people like me become lawyers in the future this will be very beneficial to building a peaceful future. Without these skills our community cannot do this. Before attending this class, I did not know about legal rights and how to protect my rights. Now, I am aware of these rights. This means I can protect myself from others who infringe upon my legal rights. Before my participation in this course, I did not have much respect for other people’s opinions and emotions. This also relates to the way I felt towards the environment. Now, when I see plastic I pick it up. Q: Do you have anything else you would like to share about SDC? A: This project and organization is very valuable to our community, I would like to encourage this program to continue and recruit more applicants than in previous years. The subjects from this course are very important and it is valuable for our community to be able to discuss political and legal issues. I could not speak Burmese fluently when I started this course. Now, I can speak Burmese and also English. I am very pleased to have been able to improve my language skills whilst learning other valuable skills. After the advanced course, I’ve got a lot of skills. These include office management which is very useful for my current job as an office worker for Karenni education. If one day I become a manager, my knowledge and skills will improve. I am now trying to improve myself every day.